Arsenal football club has been one of the great success stories of English football since the establishment of the Premier League in 1992. According to the Deloitte 2008/2009 Football Money League (page 12) at the end of the 2007/2008 season it was the 6th richest club in Europe, had successfully managed the transition to possibly the most impressive club stadium in European football at the Emirates whilst still managing to stay close to its traditional home in the London borough of Islington, all whilst remaining profitable at the pre-tax level, but still consistently producing exciting and competitive teams capable of challenging for the top sporting honours in English and European football. This constellation of positive benefits is an extraordinary achievement for a European football club, where chronic loss-making and financial instability are the norm. 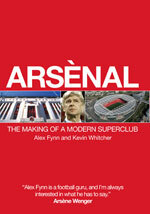 In this presentation, drawing on his experience of advising Arsenal on media and marketing, and from first hand interviews with most of the leading figures at Arsenal Football Club – including Arsène Wenger, David Dein and Danny Fiszman – interviews conducted as part of the research for his highly acclaimed book Arsènal: The Making of a Modern Superclub (co-authored with Kevin Whitcher), the paperback edition of which was published in September, Alex Fynn will present an assessment of the current health of Arsenal Football Club as its totemic manager, Arsène Wenger, turns 60 years of age. He will first examine the critical role of the Arsenal team manager in not only team affairs – building one of the most exciting young attacking teams in European football through a strong emphasis on youth talent development with a globalised reach – but also through his involvement as a key influencer on the evolution of wider business strategy at the club. Alex will then assess the future prospects for Arsenal going forward. Historically the club has been said to have benefited from a highly stable and patient shareholder base, with two major shareholders, David Dein and Danny Fiszman, acting in coalition and widely credited with having exercised a very positive stewardship of the football club. However, the decision by former club vice-chairman David Dein to sell his shareholding to Uzbek investor Alisher Usamov’s Red & White Holdings, and the arrival on the share register of American sports entrepreneur Stanley Kroenke as a significant minority investor, has fractured that stability. Alex addresses the critical question as to whether the current volatility on the share register simply represents a short-term period of transition to a new era of stability under a single investor or a new dominant coalition of minority investors; or whether in fact the club is entering a prolonged period of uncertainty in terms of its strategic direction where it may prove impossible to reconcile the contrasting visions for the club of major minority shareholders, with potentially very negative consequences for the club’s financial performance and competitiveness on the field of play. Fynn, A. & Whitcher, K. (2009). Arsènal: The Making of a Modern Superclub. London: Vision Sports Publishing. 2nd edition. Deloitte (2009). Football Money League. Manchester: Deloitte.